Developed with modern technology, Kangaroo cabs phone app uses GPS to identify the customer location and connects the customer with the nearest available driver. The booking will be confirmed immediately and will be informed to the customer via a SMS. Updated live booking information facilitates the customer to access the status of the hire, Cab location, driver phone number and plate number of the car. This feature enables the customer to save frequently used locations as favorite locations thus making it even easier to place a booking. With accurate GPS detection the Kangaroo Phone app traces all the popular locations near you. Over 1000 popular locations are updated and the list keeps adding up. This feature enables a customer to cancel a booking with a touch of a button. 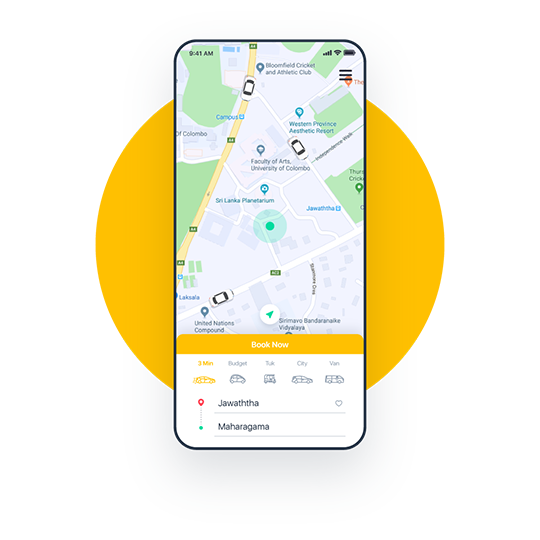 Trip Calculator facilitates the customer to get a fare estimate of the intended journey by providing the pick-up point and drop-off point details. Customers can trace their cab in real time watching the cab moving towards the pick-up location and see the expected time of arrival. We at Kangaroo value our customer feedback. All our efforts are to make sure that the Kangaroo cab ride meets our customer standards. This feature gives the option to our valued customers to rate their Kangaroo Experience helping us to serve even better in the future.